Atlantic City, NJ (September 7, 2016) - During the second of three preliminary nights for "The 2018 Miss America Competition" in Boardwalk Hall, Miss Minnesota, Brianna Drevlow, was named Thursday night’s preliminary Talent winner for her classical piano performance. Brianna will receive a $2,000 scholarship. Also capturing the spotlight was Miss Louisiana, Laryssa Bonacquisti, who was the preliminary Lifestyle and Fitness winner. Laryssa will receive a $1,000 scholarship. Founded in 1921, the Miss America Organization is one of the nation’s leading advocates for women’s education and the largest provider of scholarship assistance to young women. The Miss America Organization and its state organizations make available millions in cash and in-kind scholarships annually. The Miss America Organization also provides young women with a vehicle to further their personal and professional goals and instills within them a spirit of community service through a variety of nationwide community-based programs. 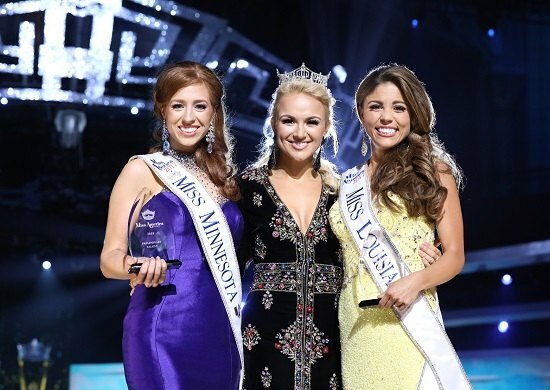 The Miss America Organization, a 501(c) 4 non-profit corporation, awards millions of dollars in annual college scholarship assistance making it the largest scholarship program for women in the United States. MAO is comprised of 51 organizations, including all 50 states and the District of Columbia. MAO contestants contribute over 500,000 hours of community service annually and have raised over $16 million for Children’s Miracle Network Hospitals since 2007.